Yes, it's Eurovision time again! Something we love on The Slow TV Blog is Eurovision and Slow TV. Slow TV can last for ages and I'm sure some must feel Eurovision goes on for a very long time, too. I got rather excited by a track in advance of last year's contest which fitted the Slow TV ethos perfectly, and Norway's entry last year, which starts very promisingly but, if I may be so bold, really got the idea of editing pace and slowness in music very wrong. Norway recently had a very long Slow TV broadcast of reindeer migration, which was guided by a Sami family of reindeer herders. Sami identity, heritage and culture were celebrated by the Slow TV broadcast which played exclusively Sami music, besides times of just the ambient background sounds of the epic journey. 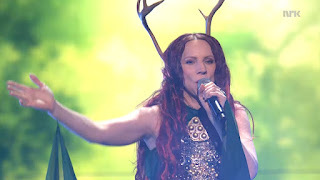 The sight of a woman with horns while singing, for the most part, a joik, would have perhaps given the entry that different look and sound, which (if, and that's a big rhetorical if, the political block-voting can be out-gamed) could have given Norway a distinct edge in the contest. Looking down the comments on the YouTube video of it for Melodi Grand Prix, I'm not alone in thinking that. Elin and The Woods have a new single out today (10th May), to follow them on Spotify, go here. It wasn't the first time Sami music had featured in Norwegian Slow TV - a Sami choir (Samisk sanggruppe / Sámi lavlunjoavku) also featured in Slow TV in 2014 during the 3 day sing through of the entire Norwegian hymn book, Salmeboka Minutt for Minutt, their performances can be seen here. Music from Reinflytting Minutt for Minutt - Reindeer Migration Minute by Minute can be explored through playlists such as here and also here. The video of Elin and The Woods performing First Step in Faith on the Melodi Grand Prix in Norway - the Eurovision selection process. I've previously touched on Sami culture on The Slow TV Blog, on Sami National Day, 6th February - more on that here.